Sometimes I am looking through my software folder for a fitting tool and it serves me a really old gems. Internet Maniac is small multipurpose networking app that had been long abandoned by developer but is still surprisingly good. 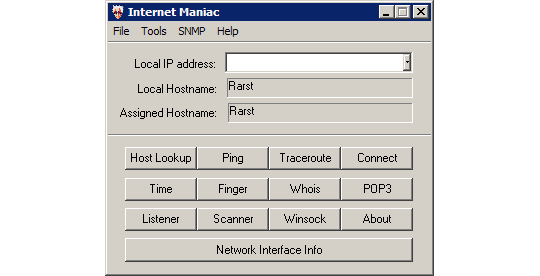 Internet Maniac combines most (if not all) classic networking utilities in single interface. and more buttons I had no opportunity to press. It is hard to provide download links for software that hadn’t been updates since 2002. Native site went silent last year and software portals where just hot-linking to it (I had to press some broken link buttons today). Wayback Machine came to rescue with cached versions of Internet Maniac home page and even download. Yep, it’s old. So are networking protocols. Despite age Internet Maniac would perfectly serve at least few more years. It’s tiny utility that packs plenty of useful networking functions. Likes to write setting in registry but works without installation. And it has ugly interface that brings back memories. Thanks for sharing this. There are lots of s/w which are old but are very useful. One s/w that i use is WinKey. you can assign shortcut keys to exe or folders or any scripts that you may run it. I am using it from last 9 years. The sad thing is it is not available on internet. I mean no updates. you may find it in some old site. I have my hotkeys covered by hardware macro keys at home (Logitech G15) and qliner hotkeys app at work. Need to do a post on latter. Oh. It’s a good utility. Never heard about it. I often use some of these commands and I always forget the syntax. So, this should help me. Thanks!